High quality branded 3M product. These respirators meet the requirements of EN149:2001 category FFP3D and protect the wearer from solid and non-volatile liquid particles. 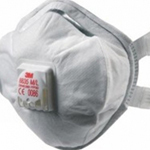 The respirator can be used in concentrations of contaminant up to 20 times the Occupational Exposure Limit.